Craig R. Barrett on Moore's law, nanotechnology, and the future of computing. This post originally appeared on Zócalo Public Square. 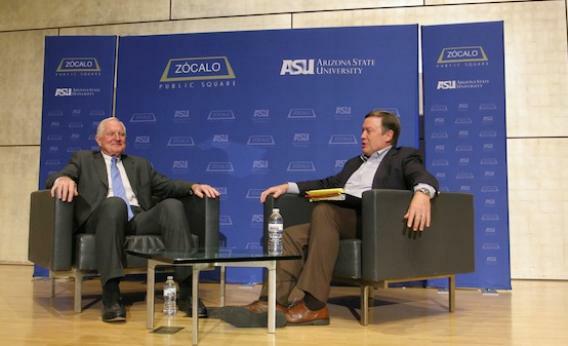 Zócalo Public Square is a partnership of the New America Foundation and Arizona State University; Future Tense is a partenrship of New America, ASU, and Slate. When Michael M. Crow, the president of Arizona State University, introduced Craig R. Barrett, the former CEO and president of Intel, he called Barrett “a singularly important actor in one of the most profound technologies in human history.” But when Barrett entered Stanford University in 1957 as a student of metallurgical engineering (not even knowing how to spell the word metallurgical), the changes of the next half-century with which he would be intimately involved were impossible to imagine. The world was only on the cusp of technologies like the modern transistor and integrated circuits that made our current digital age possible; advanced computing hadn’t yet been realized. In a wide-ranging conversation with Crow, in front of a full house—with additional audience members watching in a nearby overflow room—at the Phoenix Art Museum, Barrett discussed the past 50 years of technological change and offered some broad thoughts on his hopes for the future. In 1965, said Crow, Intel co-founder Gordon Moore (Barrett’s old boss), observed that every 18 months or so, we double our computational capabilities, an observation known as Moore’s Law. Does Moore’s Law still hold true today, or are we—as many people have predicted—reaching the end of that doubling? Even Moore, said Barrett, couldn’t imagine 10 more years of doubling, and yet “it’s really not showing much signs of slowing down.” “There’s nothing I can think of that has had this level of productivity change or enhancement in something critical to human decision-making and human life,” said Crow. What’s the driver, at a place like Intel, of this type of change—making products that are faster, cheaper, and better so rapidly? Barrett said that at Intel, Moore’s Law has been a self-fulfilling prophecy and a strategic plan. Even as academics and analysts and the media predicted the end of exponential improvements in computing, Intel kept making them, and as a result ended up continually ahead of everyone else in the industry. Every new crop of engineers at the company has received the same speech, said Barrett: We’ve been following Moore’s Law for this many years, and “it better not end on your watch.” But while computing isn’t reaching limits imposed by the science, are there social hurdles—at least in America—that are limiting factors? For instance, asked Crow, why is it harder today than it was during the Cold War to get kids interested in science, technology, engineering, and math—STEM—disciplines? Barrett said that when he entered college, engineering was the obvious pathway to the middle or upper-middle class. Today, there are more options. Still, Barrett added, engineering is a hugely valuable background. It has the highest percentage of any discipline studied by Fortune 500 CEOs and offers unmatched problem-solving capabilities. Should a multinational corporation like Intel, asked Crow, care about American success in science and technology—in terms of education and national investment? And what should this country be doing “as the future of microelectronics and integrated circuits and advanced computational devices is moving forward?” Barrett said that while Intel could continue to be a very successful corporation without hiring another U.S. citizen, as a parent and grandparent of U.S. children, he wants his family to have opportunities. For the U.S. to compete internationally, it has three levers it can pull: improving its education system, investing in research and development, and implementing government policies that “let smart people get together with smart ideas and do something.” Right now, we’re not up to par on any of those fronts, he said. So where—in the U.S. and around the world—is the excitement in technology going to come from next? Barrett thinks that in the next decade or two we’ll see more of the same sorts of developments we’ve seen before when it comes to computational power alone. But the exciting thing is going to be marrying computing capabilities with other sciences, like biology and medicine. “The possibilities of what can happen are unlimited,” he said—and combining disciplines is the next frontier. Breaking into these new frontiers will bring social and cultural disruptions. Should we, asked Crow, put our time, energy, and assets into thinking about the coming complexities? “I’m a fan, frankly, of ‘let’s let the technology move ahead,’” said Barrett. The “empowerment of options through technology,” said Crow. Yes, said Barrett, citing the theory of creative destruction. New technology can bring you wonderful things—if you give it the opportunity to explode existing structures in the process. It’s about letting chaos reign, said Barrett, rather than trying to rein it in. In the question-and-answer session, audience members continued to press Barrett on what might be next. Electronics were changed forever when vacuum tubes were replaced by transistors in circuits. What will replace transistors? Barrett called this “the 64-trillion-dollar question”—and not one it’s possible to answer yet. Until transistor speed stops doubling—making it a flat target—it’s not going to be cost-effective to produce a replacement. Right now, the transistor is “ridiculously cost-effective”: You could add up every letter in the Sunday New York Times, then divide that by the price of the paper, and the transistor would still be much cheaper than a single letter. Moore’s Law, said another audience member, has made technology disposable—we recycle our Apple products, for instance, every two years. Where is technology going from a sustainability perspective? Companies like Intel do a lot of recycling of in-house of materials like chemicals and gases, said Barrett. And Moore’s Law also means that as you double the output of product you also try to decrease the input and use fewer resources. The guts of integrated circuits—which are made up of materials like aluminum, copper, silicon, and oxygen—are not at all scarce. When it comes to the rest of the hardware that makes up a product, Europe is ahead of the U.S. in recycling and limiting use of hazardous materials—and Barrett sees more of this sort of legislation on the way. Computer power, said another audience member, has exceeded brain power, if it’s measured by bits per second. “Are we looking at computers demonstrating emergent properties not unlike the brain?” Barrett said that computers can beat humans at chess and Jeopardy!—anything in which there’s a finite number of moves, no matter how many. But computers still lack the flexibility of the human brain, and we still don’t understand everything the human brain can do. We’re not there. Yet.